April 6, 2002 – Jim Kettner’s ECWA in Newport, DE before 350 fans: Thunder and Johnny Maxx b Billy Bax and Slyk Wagner Brown, Kid Kruel b Abunai, Red b Japanese Pool Boy, Ryan Wing and Inferno b Xero and Benny Stoltzfus, Jeff Peterson b Ruffhouse Rivera (Peterson’s first match in two years since his fight with cancer), J.R. Ryder and J.J. Johnston vs. Buck Wylde and Striker vs. Joel and Jose Maximo was no contest when three refs each awarded each of the teams the match, Mr. Ooh La La b Mozart Fontaine, Bobby Rude b Cheetah Master, Low Ki and American Dragon b Christopher Daniels and Xavier in a match for the tag titles where the winner of the fall (Low Ki) got to pick his partner as champ from the other three (picked Xavier). May 4, 2002 – ECWA results in Newport, DE: Billy Baz b Kruel, Xero (last man surviving) and Abunai and Mozart Fontaine b Ryan Wing and Ruffhouse Rivera and Inferno in an elimination match, Quiet Storm b Chris Divine, Johnny Max b Japanese Pool Boy in coal miners glove match, Red won three-way over A.J. Styles and Tony Kozina (very good, Styles stood out), Mr. Ooh La La b Hat Guy form ECW, Prince Nana b Scoot Andrews in a submission match to win ECWA title, SATs won ECWA tag titles in four-way over J.J. Johnston and J.R. Ryder, Buck Wylde and Striker and Low Ki and Xavier (defending champs). Xavier came off the tron onto Striker through a table doing a 450..They did a 10 bell salute to Lou Thesz. September 14, 2002 – ECWA in Newport, DE before 300 fans: Rob Eckos b Xero, Johnny Heartbreaker b J.R. Ryder, Tyler Payne and Johnny Maxx b Inferno and Ruffhouse Rivera, Jose and Joel Maximo won elimination match for ECWA tag titles over Buck Wylde and Striker, Mozart Fontaine and Billy Bax and Divine Storm, Japanese Pool Boy b Mr. Ooh La La, Cheetah Master b Bobby Rude, Beautiful Bobby b Little Kato (Little Kato must be 60 years old by now since he came from the days when Bruce Lee played Big Kato), Red won elimination match over Xavier, Heartbreaker and Christopher Daniels to earn a title shot, Red b Prince Nana to win ECWA title. November 2, 2002 – Jim Kettner’s ECWA in Newport, DE before 275 fans: Johnny Max and Joey Max and Tyler Paine b Mr. Ooh La La and Inferno and Ruffhouse Rivera, Billy Bax b Thunder, Japanese Pool Boy b Mozart Fontaine, Striker and Buck Wylde and Johnny Heartbreaker b Prince Nana and Quiet Storm and Chris Devine, Cheetah Master b J.R. Ryder, Joel and Jose Maximo b Rob Eckos and Jimmy Vegas, Xavier b Amazing Red, Low Ki b Mike Kruel, SATs and Red b Nana and Xavier and Mega. Dustin “Screech” Diamond worked the show doing mic work complaining about Red being screwed in his match with Xavier to set up the guys coming back in the six-man. January 18, 2003 – ECWA in Wilmington, DE: Show opened with Jim Kettner thanking everyone for their thoughts, cards, letters, donations and prayers regarding his nephew, Jeff Peterson, Jimmy Vegas won Battle Royal, Japanese Pool Boy b Vegas, Striker b J.R. Ryder, Xero and Benny Stoltzfus b Inferno and Ruffhouse Rivera, Johnny and Joey Maxx b Rob Eckos and Billy Bax, Mozart Fontaine b Tyler Paine, Prince Nana and Xavier and Mega b Cheetah Master and Jose and Joel Maximo, Carlton Hightower and Eckos and Bax b Trinity and Inferno and Rivera, Christopher Daniels won five-way to become ECWA champ over Amazing Red, Mike Kruel, Low Ki and American Dragon. May 3, 2003 – ECWA in Wilmington, DE: Jose and Joel Maximo and Mercedes b Billy Bax and Rob Eckos and Venom, Mike Kruel b John Walters (sub for Amazing Red, announced as injured). Prince Nana b Japanese Pool Boy for the Mid Atlantic title, Cheetah Master b Mozart Fontaine, Striker and Ace Darling b Maxx Brothers, Nick Malaki b Mr. Ooh La La, Xero b mega, Chris Daniels won three-way over Paul London and Chance Beckett to keep ECWA title. September 6, 2003 – ECWA’s Jim Kettner 36th Anniversary Show in Newport, DE: Kid Makaze and Japanese Pool Boy b Mega and Tyler Payne, Prince Nana b Pete Gas, Shaolin Wrecking Crew b J-Busta and Mozart Fontaine, Zaquary Springate III b Nick Malakai, Christopher Daniels b Mike Kruel, Cyco b Ray DiOrio, Billy Bax and Rob Eckos b Ruffhouse Rivera and Benny Stolzfus, Johnny and Joey Maxx b Ace Darling and Striker to win tag titles. October 4, 2003 – ECWA in Wilmington, DE: Shaolin Wrecking Crew and Japanese Pool Boy b Mr. Ooh La La and Less Resistance, John Walters b Striker, Zaquary Springate III b Xero, Mike Kruel b Hijinx, Big Benny b Mike Bennett, Billy Bax and Rob Eckos b Inferno and Ruffhouse Rivera, Nick Malakai b J-Busta, Mozart Fontaine b J-Busta, Cyco b Johnny Maxx, Simon Diamond b Ace Darling, Cheetah Master and Louie Faraone and Bryan Russo b Prince Nana and Mega and Tyler Payne. April 3, 2004 – ECWA Super 8 Tournament in Wilmington, DE: Austin Aries b Shawn Daivari, Mike Kruel b Ricky Reyes, Christopher Daniels b Rocky Romero, John Walters b Nicho (with mask), Chris Daniels b Mike Kruel, Austin Aries b John Walters, Ace Darling and Striker won Battle Royal, Bax and Rob Eckos b Ace Darling and Striker, Chris Daniels b Austin Aries. May 1, 2004 – ECWA in Wilmington, DE: Japanese Pool Boy and Shaolin Wrecking Crew b Big Sky and Mayhem and Lucian, Johnny Maxx won three-way over Mozart Fontaine and Mike Tobin, Xero b Mr. Ooh La La, Nick Malakai b J-Busta, Jose and Joel Maximo and Mike Fury b Valedictorians (Billy Bax and Rob Eckos) and Freak Nastty in a TLC match, Prince Nana b Ace Darling to win Mid Atlantic title, Mega won Battle Royal, John Walters won four-way over Christopher Daniels, Mike Kruel and Austin Aries. January 15, 2005 – ECWA in Newark, Delaware: Andrew Ryker b Low Ki, O.C. Boys vs Canadian Superstars ended in a draw after a double pin, Johnny Maxx and Mike Fury and Mega b Chick Magnets, Chase Del Monte b Mr. Ooh La La, Mike Kruel b Fred Sampson, Mega b Nick Malakai by Countout, The Valedictorians (Billy Bax and Rob Eckos) b Scotty Charisma and Jason Blade, John Walters b Arch Kincaid. February 12, 2005 – ECWA in Newark, Delaware: Scotty Charisma won over John Walters, Andrew Ryker, Mike Kruel and Xavier to become ECWA champion, The Valedictorians (Billy Bax and Rob Eckos) b O.C. Boyz and Canadian Superstars to keep tag titles, Chase Del Monte b Nick Malakai, Mega NC Freak Nasty, Prince Nana b Mike Fury, Japanese Pool Boy b Brian Soscia, Logan Brothers b Mozart Fontaine and Mike Tobin, Kodiak Bear b Johnny Maxx, Striker and Fred Sampson b Mr. Ooh La La and Arch Kincaid. March 12, 2005 – ECWA in Newark, Delaware: Andrew Ryker b Mike Kruel, Mega and The O.C. Boyz b E.S. Easton and Arch Kincaid and Prince Nana, Mr. Ooh La La b Nick Malakai, Japanese Pool Boy and Johnny Maxx and Mike Fury b Chick Magnets, Logan Brothers b Canadian Superstars, Mega and Cheetah Master and Scotty Charisma b Kodiak Bear and Frank Nastty and Prince Nana, Cheetah Master vs Freak Nastty ended in a NO CONTEST, Chase Del Monte won three-way over John Walters and Xavier, The Valedictorians (Billy Bax and Rob Eckos) b Striker and Fred Sampson, Scotty Charisma b Kodiak Bear. May 14, 2005 – ECWA in Newark, Delaware: Mike Kruel b Striker, Andrew Ryker b Mr. Ooh La La, Freak Nasty b Cheetah Maser, Japanese Pool Boy and Russian Pool Boy and Mexican Pool Boy b Chick Magnets, Mega b Kodiak Bear, Johnny Maxx b Mike Fury, Aden Chambers and J-Busta won four-way over Billy Bax and Shawn Patrick, Rob Eckos and Matt Logan and Bryan Logan and Dave Cole, Chase Del Monte won three-way over J-Busta and Chambers, Scotty Charisma b Arch Kincaid. July 16, 2005 – ECWA in Newark, Delaware: Mega b Mr. Ooh La La, Vic D. Vine b Andrew Ryker, Shawn Patrick b Rob Eckos, Aden Chambers b Billy Bax, Chase Del Monte and Fred Sampson and Johnny Maxx b Chick Magnets, Cheetah Master and Ace Darling b Freak Nasty and Mike Kruel, Mark Milonas b Japanese Pool Boy, Rob Eckos and Billy Bax won Battle Royals, Scotty Charisma b Billy Bax and Rob Eckos in 3-WAY to retain his title. September 24, 2005 – ECWA in Bear, Deleware before 225 fans: Andre Ryker b Chase Del Monte, Mr. Ooh La La b Japanese Pool Boy, Chick Magnets b Mega in a 3-on-1 Handicap match, Mark Milonas b Johnny Maxx, Scotty Charisma b Vic D. Vine, The OC Boyz and Jim Kettner (promoter) b The Valedictorians (Billy Bax and Rob Eckos) and Carlton Hightower, Mike Kruel b Ace Darling, Frank Nasty vs Cheetah Master in a Lumberjack Strap match ended in a No Contest, Charlie Haas b Low Ki (Best match on the show). November 5, 2005 – ECWA in Bear, Deleware: Japanese Pool Boy b Mr. Ooh La La, Chase Del Monte and Andrew Ryker won three-way over Mike Kruel and Arch Kincaid and The Heavyweights (Sean Royal and Dan Eckos), Mega and Johnny Maxx and Logan Brothers b Mark Milonas and Chick Magnets, Cheetah Master b Freaky Nastty in a cage match, The Valedictorians (Billy Bax and Rob Eckos) b The OC Boyz, Fred Sampson won three-way over Vic D.Vine and Scotty Charisma. December 3, 2005 – ECWA in Newark, Delaware: The O.C. Boyz and Johnny Max and The Logan Brothers b The Chick Magnets and The Heavyweights (O.C. Boy-Shawn Patrick turns on O.C. Boy-Aden Chambers), Mega b Maniac Mark Milonas, Japanese Pool Boy b Thomas Penmanship, Scotty Charisma b Mr. Ooh La La, Freak Nasty and Cheetah Master b Arch Kincaid and Mike Kruel, The Valedictorians (Billy Bax and Rob Eckos) b Chase del Monte and Andrew Ryker to retain the Tag Team titles, Fred Sampson b Ace Darling to retian the ECWA title (Devon Storm and Ace darling to reunited as a team!) Kevin Kelly inducted Scoot Andrews, referee Paul Turner and Japanese Pool Boy into the ECWA Hall of Fame (Paul Bearer was also in attendance). January 13, 2006 – ECWA in Brooklyn, New York: Crowbar (Devon Storm) b The Japanese Assassin, Damien Adams b Andrew Ryker and Scotty Charisma in a 3-WAY, Tito Santana b Arch Kincaid, Low-Ki b Josh Daniels, The Valedictorians (Billy Bax and Rob Eckos) b The Logan Brothers and win the Tag Team titles, Jimmy Snuka w/Lou Albano b Mike Tobin, Mike Cruel b John Walters w/Prince Nana to retain the ECWA Title. January 28, 2006 – ECWA in Newark, Delaware: Freak Nasty b Fred Sampson, Japanese Pool Boy b Chase Del Monte and Mike Tobin in a 3-WAY, The Valedictorians (Billy Bax and Rob Eckos) b Devon Storm and Ace Darling, Shawn Patrick b Aden Chambers by DQ, Charlie Haas b Mike Kruel, Johnny Maxx and Andrew Ryker and Scotty Charisma b The Heavyweights (Sean Royal and Dan Eckos) and Mr. Ooh La La, Chick Magnets b Logan Brothers. March 4, 2006 – ECWA in Newark, Delaware: Freak Nastty b Shawn Patrick, The Valedictorians (Billy Bax and Rob Eckos) b Devon Storm and Ace Carling, Mike Tobin b Japanese Pool Boy, Bryan Logan won three-way over Aden Chambers and Matt Logan, Chambers b Arch Kincaid, Matt Logan b Chase del Monte, Bryan Logan b Mozart Fontaine, Mega b The Heavyweights (Sean Royal and Dan Eckos), Mike Kruel and Mr. Ooh La La b Andrew Ryker and Johnny Maxx. July 21, 2006 – ECWA in Newark, Delaware: Freak Nastty b Billy Bax, Mega won Battle Royal, Mega b Mr. Ooh La La, Mike Reed b Scotty Charisma, Davey Richards and Tony Kozina b Mozart Fontaine and Mike Tobin. July 22, 2006 – ECWA in Newark, Delaware: Freak Nastty b Mega, Mike Tobin b Mozart Fontaine and Brian Soscia in a 3-WAY, Mozart Fontaine won a Battle Royal, Brian Soscia won a Battle Royal, Aden Chambers and Andrew Ryker b Davey Richards and Tony Kozina, Freak Nastty and The Logan Brothers b The Valedictorians (Billy Bax and Rob Eckos) and Arch Kincaid, Scotty Charisma and Jason Jones b The Heavyweights (Sean Royal and Dan Eckos), The Chick Magnets b Pelle Primeau and Shane Hagadorn, The Valedictorians (Billy Bax and Rob Eckos) b The Logan Brothers, Ace Darling and Chase Del Monte b Kermon the German and Mike Reed. October 7, 2006 – ECWA in Newark, Delaware: Freak Nastty b Mike Reed, Glen Osbourne b Handsome Johnny, Bryan Logan b Mike Tobin, Chase N Ace b The Valedictorians (Billy Bax and Rob Eckos), Aden Chambers b Kermon the German, Frederick of Hollywood b Matt Logan, Secret Weapon b The Heavyweights (Sean Royal and Dan Eckos), Andrew Ryker and Scotty Charisma and Mega b Chick Magnets and Arch Kincaid. November 4, 2006 – ECWA in Newark, Delaware: Aden Chambers and Andrew Ryker b Ace Darling and Chase Del Monte, Glen Osbourne b Secret Weapon, The Heavyweights (Sean Royal and Dan Eckos) and Glen Osbourne b Kermon and Handsome Johnny and Mike Reed, The Valedictorians (Billy Bax and Rob Eckos) b Jason Blade and Kid Mikaze, Fredrick of Hollywood b Scotty Charisma, The Logan Brothers and Tommy Trouble b Chick Magnets, Mega b Kermon the German. December 5, 2006 – ECWA in Newark, Delaware: The Valedictorians (Billy Bax and Rob Eckos) b Aden Chambers and Andrew Ryker and Kid Mikaze and Jason Blade and Shane Hagadorn and Pelle Primeau in a 4-WAY, Easton’s Army b Freak Nasty and Mega and Glen Osbourne and Bryan Logan in a 5-WAY, The Heavyweights (Sean Royal and Dan Eckos) and Psycho b Frederick of Hollywood and The Valedictorians (Billy Bax and Rob Eckos), Ace Darling b Chase Del Monte by DQ, The Logan Brothers b Bobby Shields and Tommy Trouble, Mozart Fontaine b Scotty Charisma, The Heavyweights (Sean Royal and Dan Eckos) b The Chick Magnets. 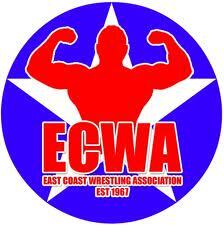 They inducted Joe Zanolle, Pete Theophall, Mozart Fontanie, Billy Bax and Rob Eckos into the ECWA Hall of Fame. January 27, 2007 – ECWA in Newark, Delaware: 10-bell salute for Doug Gentry and Bam Bam Bigelow. Glen Osbourne b The Secret Weapon and Mike Read and Kermon the German in a 3-on-1 Handicap match, Chase Del Monte and Aden Chambers and Matt Logan b Ace Darling and Bobby Shields and Tommy Trouble (Run for the Mid Atlantic Gold 6 man Tag Match), Vince Goodnite and Andrew Ryker and Scotty Charisma b Mike Tobin and Mozart Fontaine and Brian Soscia (Run for the Mid Atlantic Gold 6 man Tag Match), Aden Chambers and Chase Del Monte and Matt Logan b Vince Goodnite and Andrew Ryker and Scotty Charisma (Run for the Mid Atlantic Gold 6 man Tag Match Finals), Bryan Logan b Matt Logan and Chase Del Monte and Aden Chambers in a 4-WAY to retain the ECWA Mid Atlantic title, The Heavyweights (Sean Royal and Dan Eckos) b The Valedictorians (Billy Bax and Rob Eckos) to win the ECWA Tag Team titles, Guy with Red hair won a 30-Man Battle Royal, Freak Nastty b Frederick of Hollywood to retain the ECWA Heavyweight title. March 17, 2007 – ECWA in Newark, Delaware at the Boys and Girls Club: Scotty Charisma and Andrew Ryker and Chase Del Monte b The Chick Magnets, Max Von Bauer and Kermon the German b Sean Royal and Matt Logan, The Hollywood Connection (Fredrick of Hollywood and Mike Reed) b Glen Osbourne and Aden Chambers, Guy with Red Hair b Robere Shields, Tommy Trouble b Chase Del Monte, Rob Eckos b Dan Eckos in a Street Fight, The Secret Weapon b 400 lb. Mega, Bryan Logan b Ace Darling to retain the Mid Atlantic title, Aden Chambers b Freak Nastty (c) and Darling and Frederick of Hollywood in a 4-WAY to win the ECWA Heavyweight title – Freak Nastty attacked an ECWA Official and got himself FIRED! May 12, 2007 – ECWA – Annual Night of Unusual Matches in Newark, Delaware at the Greater Newark Boys’ and Girls’ Club: Mega and Guy with Red Hair b Tommy Trouble and Robere Shields, Scotty Charisma b “Valedictorian” Billy Bax, “The Fighting Paramedic” Cory Blaze won a Battle Royal, Freak Nastty b The Chick Magnets, Ace Darling b Chase del Monte, Max Von Bower and Kermon the German b The Logan Brothers, Cheetah Master b Andrew Ryker, The Heavyweights (Sean Royal and Dan Eckos) b The Hollywood Connection (Fredrick of Hollywood and Mike Reed) and Secret Weapon and Glen Osbourne in a 3-WAY Tag match (Secret Weapon viciously attacked Glen Osbourne after the match), Aden Chambers b “Valedictorian” Rob Eckos to retain the the ECWA Heavyweight title. July 13, 2007 – ECWA in Newark, Delaware at the Greater Newark Boys’ and Girls’ Club: Mega b Kano Kross, Mr. La La made a guest appearance, Scotty Charisma and Sean Royal b Robere Shields and Mario Zuto, Sean Royal won a Battle Royal, Aden Chambers b Billy Bax to retain the ECWA Heavyweight title. July 14, 2007 – ECWA (Matinee Show) in Newark, Delaware at the Greater Newark Boys’ and Girls’ Club: The Logan Brothers and Psycho b Frederick of Hollywood and Mike Reed and Robere’ Shields, Mega and Mike Nice b Secret Weapon and Rick Fuller, Corey Blaze and Jason Leigh and J.J Cruz b The Chick Magnets, Andrew Ryker b Tommy Trouble, Mega won the Boogie Woogie Brown Memorial Cup, Chase Del Monte and Freak Nastty (reinstated to the roster) b Cheetah Master and Ace Darling, Scotty Too Hotty b Billy Bax, The Heavyweights (Sean Royal and Dan Eckos) b The Berlin Bad Boys to retain the ECWA Tag Team titles, Aden Chambers b Scotty Charisma and Rob Eckos in a 3-WAY to retain the ECWA Heavywieght title. September 15, 2007 – ECWA – 40th Anniversary Show in Newark, Dalaware: The Green Team b El Trouble and Robere Shields and Mr. Ooh La La, The Chick Magnets b Mega and Mike Nice and Billy Bax, J.J. Crew Guy won a Battle Royal to become Cheetah’s assistant, Glen Osbourne and Scotty Charisma b Mike Nice and Matt Logan, The Berlin Bad Boys b Mario Zutto and Alec Chance, Ace Darling b Chase Del Monte in a Lumberjack Match, Freak Nastty won the Survivor Showdown, Bryan Logan b The Secret Weapon to retain the Mid-Atlantic title, The Heavyweights (Sean Royal and Dan Eckos) b The Hollywood Connection to retain the ECW Tag Team titles, ECWA Champion Adam Chambers vs. “Hurricane” John Walters ended in a No Contest. October 13, 2007 – ECWA – ECWA Halloween Show in Newark, Dalaware at the Greater Newark Boys’ and Girls’ Club: Prince Nana (head of RGN) fired promoter Jim Kettner, Guy w/Red Hair b Mr. Ooh La La and Robere Shields, Green Team b The Hollywood Connection, The Chick Magnets b Alec Chance, Mike Nice and Mega, Mr. Scott Wright b Glen Osbourne by DQ, Secret Weapon b Freak Nastty, Chase Del Monte b Ace Darling in a Steel Cage Match, Bryan Logan b Billy Bax and Rob Eckos and Matt Logan and El Trouble in a 5-WAY to retain the ECWA Mid-Atlantic title, Berlin Bad Boys b The Heavyweights (Sean Royal and Dan Eckos) in a Steel Cage to win the ECWA Tag Team titles, Aden Chambers b John Walters in a Steel Cage Match to retain the ECWA Heavyweight title. November 10, 2007 – ECWA – 11th Annual Super 8 Tournament in Newark, Dalaware at the Greater Newark Boys’ and Girls’ Club: Rob Eckos b Billy Bax in a 1st Round match, Matt Logan b Rob Conway in a 1st Round match, Jerry Lynn b Brian Fury in a 1st Round match, Sonjay Dutt b Human Tornado in a 1st Round match, Sonjay Dutt b Rob Eckos in a Semi-Final match, Jerry Lynn b Matt Logan in a Semi-Final match, Prince Nana won a 28-Man Rumble Match, Jerry Lynn b Sonjay Dutt in the Finals to win the 2007 Super 8 Tournament. December 1, 2007 – ECWA – ECWA Hall of Fame Show in Newark, Dalaware at the Greater Newark Boys’ and Girls’ Club: Low Ki and Sebastian Night and Iron Man and Gary McLaughline were inducted into the ECWA Hall of Fame, The Chick Magnets b The Green Team, Billy Bax b Rob Eckos, Mr. Scott Wright b Glen Osbourne, Team Mega b Team Darling in a Survivor Match, J.J. The Crew Guy b Chase Del Monte, Ace Darling b Freak Nastty, Freak Nastty b Ooh La La and Travis Blake and Fred of Hollywood and El Trouble in a 5-WAY, The Logan Brothers b The Valedictorians (Billy Bax and Rob Eckos) and The Heavyweights (Sean Royal and Dan Eckos) and The Berlin Bad Boys in a 4-WAY to win the ECWA Tag Team titles, Aden Chambers b “Hot Shot” Mike Reed to retain the ECWA Heavyweight title. January 19, 2008 – ECWA – Night of Unusual Matches in Newark, Dalaware at the Greater Newark Boys’ and Girls’ Club: The Heavyweights (Sean Royal and Dan Eckos) and J.J. Cruz b The Chick Magnets in a Steel Cage Match, J.J. Crew Guy and Mike Reed b Chase Del Monte and Mega in an Elimination match, Corey Blaze and Jason Leigh and Alec Chance b Ooh La La and Robere Shields and Tim Richards in a Weapons match, Mr. Scott Wright b Glen Osbourne in a First Blood match, Aden Chambers b Tommy Trouble in a Ladder match to retain the ECWA Heavyweight title, Freak Nastty b Ace Darling in a Lumberjack match, The Logan Brothers b The Berlin Bad Boys and The Valedictorians (Billy Bax and Rob Eckos) in a TLC Match to retain the ECWA Tag Team titles. March 1, 2008 – ECWA in Newark, Dalaware at the Greater Newark Boys’ and Girls’ Club: Robere Shields and Tommy Trouble b J.J. Crew Guy and Mike Reed and Glen Osbourne and Mega in a 3-WAY Tag match, Travis Blake and Chase Del Monte b The Valedictorians (Billy Bax and Rob Eckos) and The Chick Magnets in a 3-WAY Tag match, Ace Darling won a Mid Atlantic Riot #1, J.J. Cruz won a Mid Atlantic Riot #2, The Nigerian Nightmares b The Heavyweights (Sean Royal and Dan Eckos), J.J. Cruz b Ace Darling to win the vacant ECWA Mid Atlantic title, The Logan Brothers b Robere Shields and Tommy Trouble and Chase Del Monte and Travis Blake in a 3-WAY Tag match to retain the ECWA Tag Team titles, Freak Nastty b Prince Nana to win ECWA Ownership, Scott Wright b Aden Chambers to win the ECWA Heavyweight title. April 5, 2008 – ECWA in Newark, Dalaware at the Greater Newark Boys’ and Girls’ Club: Travis Blake and Chase DelMonte and Loca Vida b The Chick Magnets, 400 lb. Mega b Kermon the German, Aden Chambers b Frederick of Hollywood and Tommy Trouble in a 3-WAY, Human Tornado b Mr. Ooh La La and Robere’ Shields, The Heavyweights b Leather N Lace by DQ, Prince Nana and Nigerian Nightmares b Freak Nastty and The Logans, Ace Darling b J.J. Cruz to win the Mid Atlantic Title, Ace Darling won a 22 man Battle Royal, Glen Osbourne b Scott Wright to win the ECWA Heavyweight title. July 26, 2008 – ECWA in Newark, Delaware: Aden Chambers and J.J. Cruz and Robere Shields b Jason Leigh and Chase Del Monte and [INSERT] Grand, Jason Leigh and Chase Del Monte and [INSERT] Grand b Mr. Ooh La La and Corey Blaze and Tim Richards, Travis Blake b Mozart Fontaine, Mr. Scott Wright b “Heavyweight” Dan Eckos, Tommy Trouble b Kermon the German, Leather N Lace b The Valedictorians (Billy Bax and Rob Eckos), Prince Nana and The Nigerians b Jim Kettner and The Logans, Mega and Cha Cha Chance b Duke of Elegance and The Squire, Chase Del Monte b Ace Darling and Robere Shields and Aden Chambers in a 4-WAY to win the Mid Atlantic Title, Frederick of Hollywood b Glen Osbourne to win the ECWA Heavyweight title. September 27, 2008 – East Coast Wrestling Association in Newark, Delaware at the Greater Newark Boys’ and Girls’ Club: Frederick of Hollywood b Travis Blake, Leather N Lace b The Logan Brothers, Dan Eckos b Billy Bax and Jason Leigh and Chase Del Monte and J.J. Cruz in a 5-way, Cha Cha Chance vs. Mega ended in a Double Countout, Glen Osbourne b Ace Darling, Tommy Trouble b Kermon the German, Aden Chambers b Prince Nana, Corey Blaze b Tim Richards, Mega and Cha Cha Chance b Robere Shields and Gus Grand, Sean Royal b Scott Wright. October 25, 2008 – East Coast Wrestling Association – Super 8 in Newark, Delaware at the Greater Newark Boys’ and Girls’ Club: Chase Del Monte b Scott Reed in a 1st Round match, Maverick b Loca Vida in a 1st Round match, Aden Chambers b Frankie Arion in a 1st Round match, Alex Koslov b Shannon Moore in a 1st Round match, Aden Chambers b Maverick in a Semi-Final match, Alex Koslov b Chase Del Monte in a Semi-Final match, Aden Chambers b Alex Koslov in the Finals to win the Super 8 Tournament, Magnum won the Annual Summit. November 22, 2008 – East Coast Wrestling Association in Newark, Delaware at the Greater Newark Boys and Girls Club before 300 fans: The Logan Brothers b The Chick Magnets, Magnum b Freak Nastty, The Valedictorians b Aden Chambers and Chase Del Monte, Glen Osbourne b Prince Nana, Cha Cha Chance and Mega b Scott Wright and Maverick, El Sensationel won a 9 man Lucha Bowl, Leather N Lace b The Nigerian Nightmares, Sean Royal b Dan Eckos to win the Mid Atlantic title, Tommy Trouble b Frederick of Hollywood to win the ECWA Heavyweight Title. January 24, 2009 – East Coast Wrestling Association in Newark, Delaware at the Greater Newark Boys and Girls Club: Courageous Cruz b Mr. Scott Wright, Andrew Ryker b Travis Blake, Del Monte and The Logans b The Chick Magnets, Freak Nastty b Nigerian Nightmare Maifu, Nigerian Nightmare Maifu won a Bounty Battle Royal, Leather N Lace b Mega and Cha Cha Chance by DQ, The Heavyweights (Sean Royal and Dan Eckos) b The Valedictorians (Billy Bax and Rob Eckos), Rob Eckos b Billy Bax to win the ECWA Mid Atlantic Title, Tommy Trouble b Aden Chambers and Prince Nana and Frederick of Hollywood in a 4-WAY to retain the ECWA Heavyweight title. March 7, 2009 – East Coast Wrestling Association in Newark, Delaware at the Greater Newark Boys and Girls Club: Magnum and Frederick of Hollywood and Andrew Ryker b Travis Blake and Jason Leigh and Aden Chambers, The Heavyweights b Scott Reed and Frankie Arion, Couragous Cruz b Mr. Ooh La La, Glen Osbourne and Corey Blaze b Scott Wright and Tim Richards, Rob Eckos b Chase Del Monte, The Logan Brothers b Tiki and Falah, Nigerian Saifu b Nigerian Maifu, Cha Cha Chance and Mega b Leather N Lace, Chase Del Monte b Billy Bax and Frederick of Hollywood and Dan Eckos in a 4-WAY. April 18, 2009 – East Coast Wrestling Association in Newark, Delaware at the Greater Newark Boys and Girls Club: Travis Blake and Jason Leigh and Corey Blaze b Tiki Tabu and Mr. Ooh La La and Tim Richards (w/Coach Jim Shorts), Courageous Cruz b “The A-List” Andrew Ryker (w/Ring Announcer Arthur Avalon and Agent Gus Grand and manager Magnum) by reverse decision, Bazooka Joe (w/E.S. Easton) b Aden Chambers, Mr. Scott Wright (w/Coach Jim Shorts) b Freak Nastty, Cha Cha Chance and Mega b The Heavyweights (Sean Royal and Dan Eckos) and Leather and Lace (J.J. the Ring Crew Guy and “The Hot Shot” Mike Reed w/Sebastian Night) in a “Beat The Clock” Texas Tornado match to retain the ECWA Tag Team titles, “The Nigerian Nightmare” Maifu (w/ Tiki Tabu) b “The Beast” Glenn Osbourne, The Logan Brothers (Matt and Bryan and Nick) b Frederick of Hollywood (w/Magnum) and “The Valedictorian” Billy Bax and “Nigerian Nightmare” Saifu, Chase Del Monte b “The Samoan Mastadon” Falah in a Samoan Strap Lumberjack match to retain the ECWA Heavyweight title. May 16, 2009 – East Coast Wrestling Association in Newark, Delaware: Chase Del Monte b Hot Shot Mike Reed, Cha Cha Chance and Mega b Bazooka Joe and Scott Wright, Team Blaze b Team Richards, Matt and Bryan and Nick Logan b Rob Eckos and Billy Bax and Falah, Andrew Ryker b Jason Leigh, Prince Nana b Freak Nastty, Magnum and Hollywood Chick Magnets b Heavyweights and Courageous Cruz, Geln Osbourne b Maifu, King V b Frederick of Hollywood. July 18, 2009 – East Coast Wrestling Association in Newark, Delaware at the Greater Newark Boys’ and Girls’ Club: Freak Nastty and Aden Chambers and Glen Osbourne b Prince Nana and JJ Crew Guy and Bazooka Joe, Andrew Ryker b Jason Leigh, The Arion Brothers b The Logan Brothers, Courageous Cruz and Super Mega b Mr. Ooh La La and Tim Richards, Magnum and The Hollywood Chick Magnets b The Heavyweights and Travis Blake (Travis Blake turned on his team and joined the Hollywood Chick Magnets), Prince Nana won a 26 man Battle Royal, Cha Cha Chance and Mega b Scott Wright and Mike Reed to retain the ECWA Tag Team titles, Nick Logan b Rob Eckos to win the Mid Atlantic Title, Chase Del Monte b Prince Nana to retain the ECWA Heavyweight title. September 12, 2009 – East Coast Wrestling Association in Newark, Delaware at the Greater Newark Boys’ and Girls’ Club: Billy Bax b Courageous Cruz, The Logan Brothers b the Hollywood Chick Magnets, Glen Osbourne b J.J. Crew Guy, Dan Eckos b Mr. Scott Wright, Corey Blaze and Jason Leigh b Tim Richards and Ooh La La, Freak Nastty vs. Andrew Ryker ended in a Double DQ, The Arion Brothers b Cha Chance and Mega to win the ECWA Tag Team Titles, Bazooka Joe b Chase Del Monte to win the ECWA Heavyweight title. October 10, 2009 – East Coast Wrestling Association – 13th Annual Super 8 Tournament in Newark, Delaware at the Greater Newark Boys’ and Girls’ Club: Quiet Storm b Mikaze in a 1st Round match, Dan Eckos b Metal Master in a 1st Round match, Tommaso Ciampa b Mike Tobin in a 1st Round match, Nick Logan b Prince Nana in a 1st Round match, Bazooka Joe and Andrew Ryker b Freak Nastty and Chase Del Monte, Tommaso Ciampa b Dan Eckos in a 2nd Round match, Nick Logan b Quiet Storm in a 2nd Round match, The Logan Brothers won the Tag Team Summit, The Logan Brothers b The Arion Brothers to win the ECWA Tag Team titles, Nick Logan b Tommaso Ciampa in the Finals to win the 13th Annual Super 8 Tournament. January 23, 2010 – East Coast Wrestling Association – Night of Championships in Newark, Delaware at the Greater Newark Boys’ and Girls’ Club: Bazooka Joe b Freak Nastty to retain the ECWA Heavyweight title, ECWA Tag Team champions The Logan Brothers (Matt and Bryan) vs. Tony Burma and Ryan Rush ended in a No Contest, Mid Atlantic champion Nick Logan vs. Aden Chambers ended in a No Contest, Courageous Cruz b Ron Godwin in a Lumberjack Match, Cha Cha Chance b J.J.Crew Guy, Chase Del Monte b “The Platinum Poppa” Rob Eckos, Mr. Scott Wright and Billy Bax b The Heavyweights (Dan Eckos and Sean Royal), Mega b Andrew Ryker, The Hollywood Chick Magnets and Tim Richards and Mr. Ooh La La b Glen Osbourne and Jason Leigh and Mozart Fontaine and Corey Blaze in an 8-Man Elimination match. March 20, 2010 – East Coast Wrestling Association – in Newark, Delaware at the Greater Newark Boys’ and Girls’ Club: Bazooka Joe b Mozart Fontaine, Julian Starr and Aden Chambers and Ryan Rush b Nick and Bryan and Matt Logan, Tim Richards and Bully Busick b Corey Blaze and Jason Leigh, Courageous Cruz b Brian Milonas, Chase Del Monte b Andrew Ryker, Glen Osbourne and Sean Royal and Dan Eckos b Mr. Scott Wright and Billy Bax and Magnum. Mega and J.J. Crew Guy were inducted into the ECWA Hall of Fame. May 8, 2010 – East Coast Wrestling Association – in Newark, Delaware at the Greater Newark Boys’ and Girls’ Club: Simple Simon b Mr. Ooh La La, Corey Blaze and Jason Leigh b Tim Richards and Bully Busick, Rob Eckos and Billy Bax b Corey Blaze and Jason Leigh, Tony Burma and Alex Reynolds b Rob Eckos and Billy Bax, Alex Reynolds and Tony Burma b Dan Eckos and Elia Markropolous, Freak Nastty and Courageous Cruz b Alex Reynolds and Tony Burma, Chase Del Monte and Joel Oresky b Arthur Avalon and Andrew Ryker, Nick and Matt and Bryan Logan b Aden Chambers and Ryan Rush and Julian Starr. Mega b Bazooka Joe. July 10, 2010 – East Coast Wrestling Association – 14th Annual Super 8 Tournament in Newark, Delaware at the Greater Newark Boys’ and Girls’ Club: Nick “U-Gene” Dinsmore b Mr. Scott Wright in a 1st Round match, Chris Wylde b Alex Reynolds in a 1st Round match, Tommaso Ciampa b Chase Del Monte in a 1st Round match, Austin “Consequences” Creed b Brian Milonas in a 1st Round match, Matt and Bryan and Nick Logan b Ryan Rush and Aden Chambers and Julian Starr, Austin “Consequences” Creed b Nick “U-Gene” Dinsmore in a Semi-Final match, Tommaso Ciampa b Chris Wylde in a Semi-Final match, Magnum won a 16 man Summit Battle Royal, Austin “Consequences” Creed b Tommaso Ciampa in the Finals to win the 14th Annual Super 8 Tournament. October 16, 2010 – East Coast Wrestling Association – in Newark, Delaware at the Greater Newark Boys’ and Girls’ Club: Chris Wylde b Aden Chambers, Corey Blaze b J.J. Crew Guy (w/Sebastian Night and Revolution) by DQ, Travis Blake (w/agnum and Gus Grand) b Cono Cappuccia, The Best Around (T.J. Cannon and Bruce Maxwell) b Matt Logan and Chase Del Monte and Sean Royal and Dan Eckos in a 3-WAY to win the ECWA Tag Team titles, MEGA vs. Glen Osbourne ended in a Double DQ, Andrew Ryker w/Arthur Avalon b Bazooka Joe to retain the ECWA Title, Shane “Hurricane” Helms and The Blue Meanie and Shockwave the Robot and Kid America and Courageous Cruz b Mr. Ooh La La and Nicky Benz and Cujo the Hellhound and Scott Wright and Jason Leigh (w/Larry Winters and Coach Jim Shorts). January 15, 2011 – ECWA in Newark, DE: Corey Blaze b Mr. Ooh La La, Papadon b Cono Cappuccia, JJ Crew Guy and Timothy Richards b Matt Saigon and Damian Dragon, Travis Blake b Courageous Cruz, Ace Darling b Aden Chambers-DQ, Team Macktion b Aden Chambers and Julian Starr, Kid America b Jason Leigh, Chris Wylde b Mozart Fontaine, T.J. Cannon and Bruce Maxwell b Dan Eckos and Sean Royal, Mega b Glen Osbourne. March 5, 2011 – ECWA in Newark, DE: Russian Assassin and Mr. Ooh La La b Kid America and Courageous Cruz, Corey Bluze b Cujo the Hellhound, Sean Royal b Magnum, Papdon b Bazooka Joe, Shawn Patrick b Aden Chambers-DQ, Chris Wylde b Kekoa the Flyin Hawaiian, MattSaigon and Damian Dragon b The Best Around, Mega and Cha Cha Chance b J.J. the Ring Crew guy and Mozart Fontaine and Tim Richards, Papadon b Mega. D.J. Hyde is the new ECWA commissioner. Next show is 4/30, the annual Super 8 tournament, at Flyers Skate Zone in Voorhees, NJ with Tommaso Ciampa, Sami Callihan, Adam Cole, Shockwave the Robot, Bobby Shields, Shiima Xion and Austin Aries. March 3, 2012 – ECWA in Newark, DE: Shane Strickland b Alex Payne, Bandido Jr. and Azrieal b Danny E and Ricky Martinez, Shazza McKenzie b Kylie Pierce, Corey Blaze b Kid USA, Alex Reynolds b Tony Nese, Paul Lopreesti NC Mr. Oooh La La in what was billed as an MMA exhibition, Fusion-DS b Midnight Sensations, Bobby Shields and Breaker Morant and Josh Daniels b Chris Wylde and Kekoa the Flyin Hawaiian and Ahtu, Papadon b Johnny Silver.